o.k. my mom died, too. 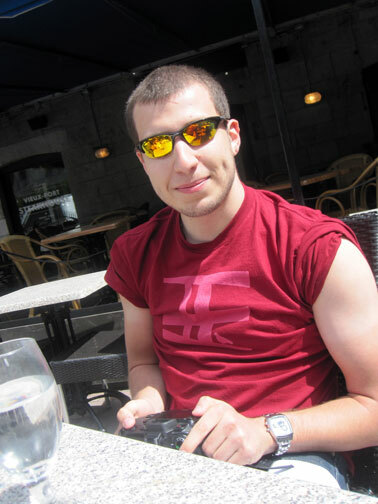 Oct 16, 2010. 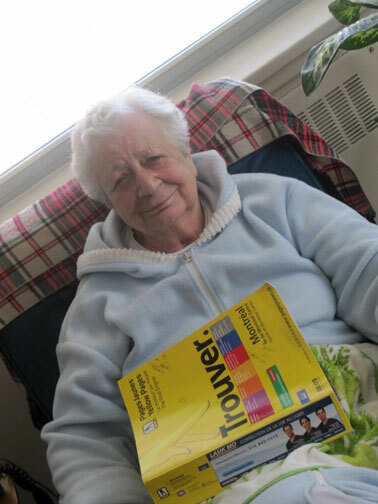 She was 86 years old and she lived in Montreal, where I was born. I left for NYC in 1981 and I never looked back. actually last May 2010 – was the very first time I went back. 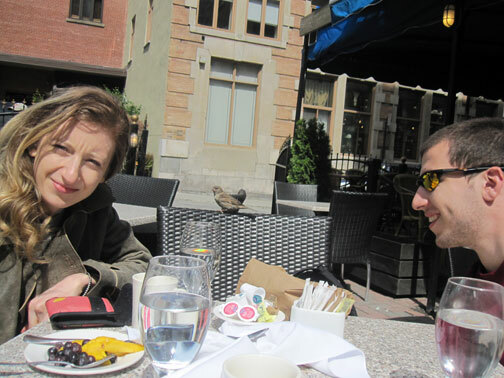 Kate and Theo came along – it was their first time – ever – in Montreal. we all brought cameras, and we had a lot of fun, especially eating out. this was all of our’s favorite piece of visual art in the city, otherwise the city’s art scene is pretty much dead and gone. 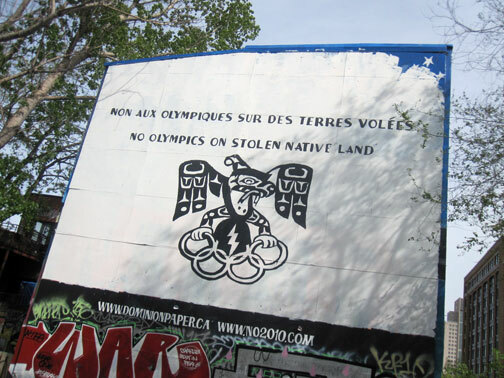 it says: NON AUX OLYMPIQUES SUR DES TERRES VOLEES / NO OLYMPIQUES ON STOLEN NATIVE LAND. art aside, the music scene in Montreal is pretty happening – and so were their posters. THE NEW PORNOGRAPHERS – were playing JUNE 17, 2010 – at Le National. and we caught a super great band, esp live – THE JON COHEN EXPERIMENTAL – at CASA del POPOLO – kind of like our CAKE SHOP – more on that, with pix & links – next post !! there were also several great art cinemas. 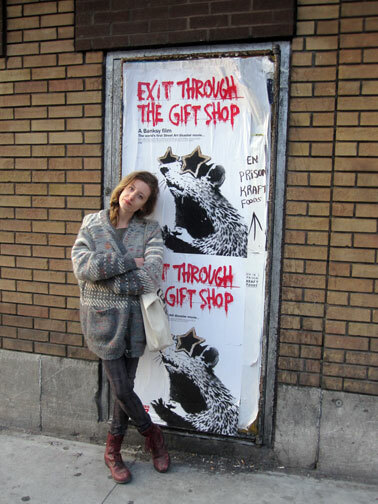 we caught Banksy’s ‘EXIT THRU THE GIFT SHOP’ and that great new JIM MORRISON documentary – ‘When You’re Strange’ – narrated by JOHNNY DEPP, and chockful of vintage clips and archival video footage – which came out the very week – we were there. coming home like that, for the first time in over 30 years – the wild child who split for NYC – it seemed a very potent film to watch at the time. a big connecting dot – on the real-time stream of life. see: JIM MORRISON/DOORS/WHEN YOU’RE STRANGE !! 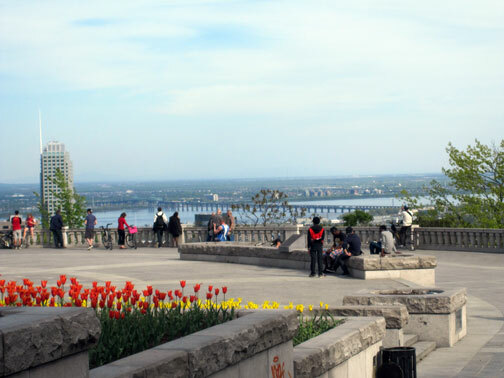 although the city is kept beautifully clean, esp the landmarks – and I mean that profoundly. 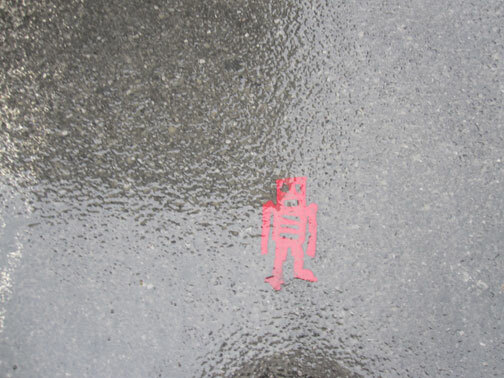 I did catch an un-obtrusive tiny MR. STIKMAN, on the street right under my very feet. yes. surprise. and guess where ? 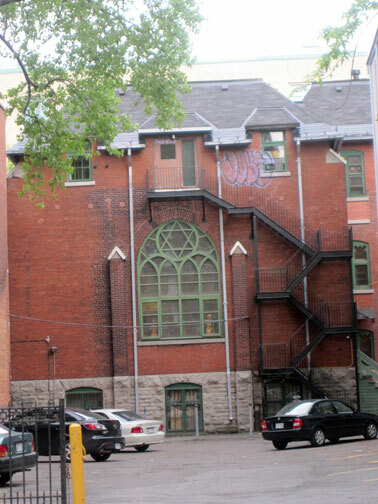 right in front of the International Newspapers store – downtown on Ste. Catherine St., near Peel – where I went to grab my daily fix – of the NEW YORK POST – maybe MR. STIKMAN, did too ? this was one vintage window design that really stopped me. I guess it was a synagogue. and then there was a tag job higher up – that reminded me of home, NYC – and yeah I was glad there wasn’t – more of it. there is an art to tagging. this wasn’t it. 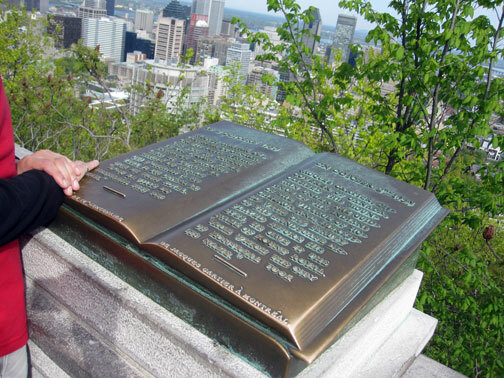 Montreal is a city that grew up on an island just like New York, but the island is really a mountain – Mont Royal – and the view from the top – the easily accessed “look-out” – is just as awesome as ever. 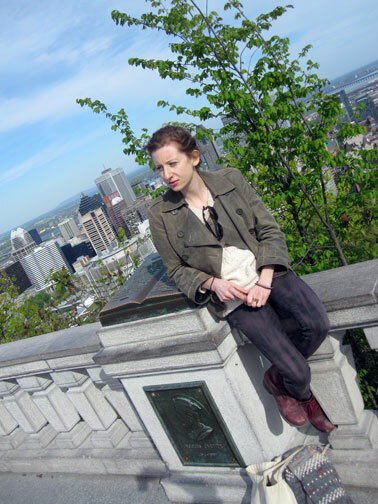 KATE almost gave me a heart attack – perching on the guard rail. unlike the good ole US of A – I was amazed to realize – there was not, absolutely not – one security guard in sight. BEAVER LAKE, just a short stroll from the look-out. we had many a family picnic there, when I was growing up. 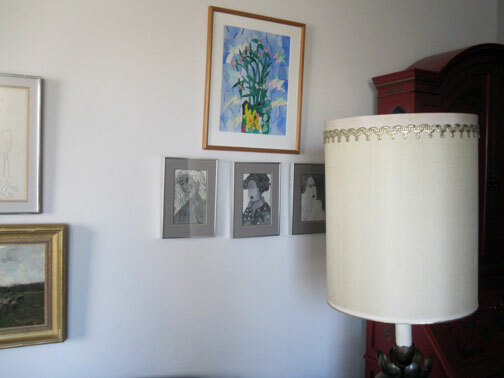 the most curious part was seeing all my early art work on my mom’s apt walls. 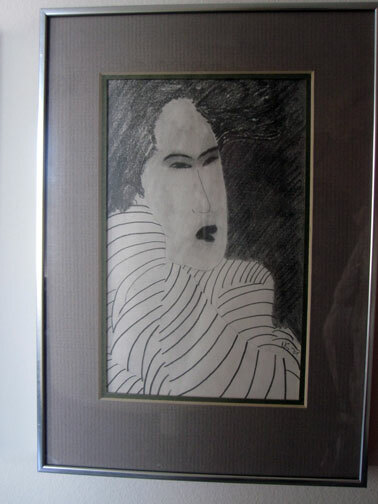 work I had done more than 30 years ago . . . I hadn’t known she had surrounded herself with my work. I was the bad girl. what can I say ? but apparently – she loved my work. I never did tell her about my recent somewhat starring role in ‘WE LIVE IN PUBLIC’, ha. I didn’t think she’d get it. but she always wanted me to be a journalist, instead of an artist, so go figure. 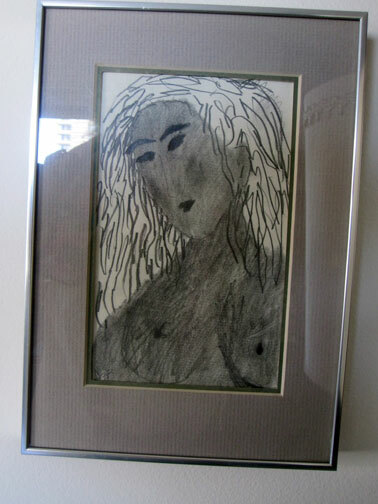 in fact she never had a computer, and she never really knew what artlovers was. she’d be kinda freaked, I guess to see her photo posted on the web !! I did a whole series of drawings, pencil on paper, 4 x 6 in. 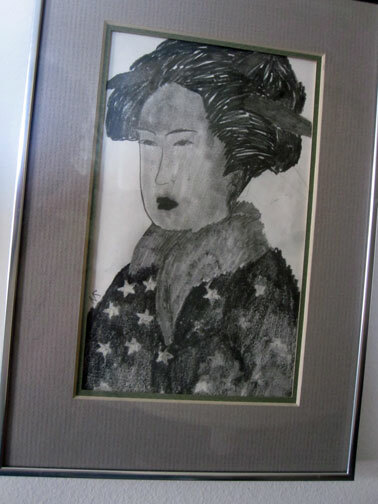 re-imaging myself into Japanese 18th C. woodblock print culture – as my graduate thesis. I know it doesn’t seem very radical now – but you have to go back to the context of when they were done and art school culture – back in the 70’s. back then, it was all about AGNES MARTIN, minimalism, abstraction, and huge huge color field paintings – so this was very out of left field – on every level. scale, intimacy, pictorials, narrative, drawing. pencil. etc. it was at Concordia University, actually the very first graduating class of the very first MFA program in the country – they almost didn’t pass my thesis – but I remember clearly – when I just shrugged my shoulders and walked out the door – they stamped it approved. the famous Canadian Quebecois color-field painter GUIDO MOLINARI was my mentor and teacher. I had a nickname back then, too . . . but it wasn’t – ‘crackula’ – it was: ‘guido baby’ !! 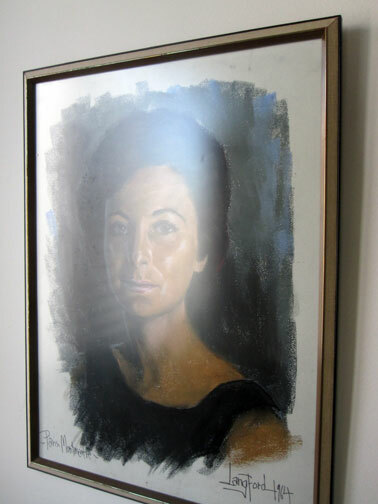 my mom took me and my brother to Paris, France in 1964. like many tourists, she had her portrait done in oil pastels by a street artist. it’s signed, Langford. after all these years, I was pretty amazed at how well it had stood the test of time. the best memory of my mom ? she bought me the very first BEATLES album – ‘TWIST AND SHOUT ‘ – to come out in Montreal, the moment it dropped – and I was absolutely the very first on my block, even in my school, to possess it . . . talk about a point . . . in space . . . nowhere boy meets nowhere girl. for one of the few times in her life – she vibed it – right on the dot – and bestowed a little solace – on her wild child.